The Cotswolds village of Broadway in the English county of Worcestershire is often referred to as the 'Jewel of the Cotswolds' and the 'Show Village of England' because of it's sheer beauty and magnificence. The 'broad way' leads from the foot of the western Cotswolds escarpment with a wide grass-fringed street lined with ancient honey coloured limestone buildings dating back to the 16th century and earlier (the oldest house is Abbots Grange built in 1320 as the summer retreat for the Abbots of Pershore). Broadway in the Cotswolds not to be confused with the oldest north-south main Broadway thoroughfare in New York City 15 miles long through Manhattan and The Bronx. There are, however, American connections with the colony of artists that settled in this village. Many well known characters have spent time in Broadway drawing inspiration from its beauty and location including Oscar Wilde, Claude Monet, Edwin Abbey, John Singer-Sargent, William Morris and Edward Elgar. The village is nestled at the foot of Fish Hill (where apparently monks used to store fish and the 18th century ‘Fish Inn’ once stood). 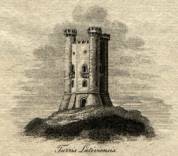 Broadway Tower (sometimes also referred to as Beacon or Fish Inn Tower) is 65ft high and stands atop the hill overlooking the village. A much loved retreat for the Arts and Crafts Movement founder William Morris, this marvellous folly was built by the sixth Earl of Coventry’s family in the late 18th century, and on a clear day you can see no fewer than 14 counties from the top of it. As part of an extensive country estate (which also houses an animal park), it lies close to an Anglo-Saxon cemetery, where eight graves complete with knives, spears, beads and brooches were excavated in 1954. The full extent of Broadway's majesty is its wide street lined with a delightful mix of Tudor, Stuart and Georgian buildings. The village has one of the longest High Streets in England. The village's "broad way" (actually called High Street) lined with red chestnut trees, reflects the varied architectural history from grand Georgian buildings to ones of humbler though quaint beginnings that even reaches back, in places, to the Romans. In the 17th century Broadway village became a busy staging post on the route from Worcester to London as coaches had to harness extra horses for the long pull up Fish Hill. As many as 33 inns existed within the village to service the many travellers passing through - three exist today. Broadway has it all from several art galleries, gift and clothes shops to three inns, Italian restaurant, half-dozen tea shops, two hotels including the famous Lygon Arms, two brasseries and a wonderful Fish and Chip restaurant and take-away. Retail therapy combined with good food & drink and chilling-out makes Broadway a very popular place in the Cotswolds to stay and visit throughout the year. 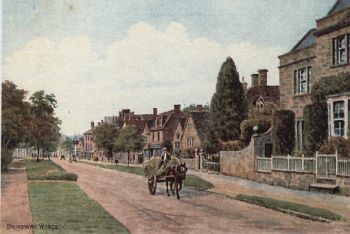 The village was the inspiration to a number of writers and artists (see Broadway Group) including Henry James, J.M.Barrie,Vaughan Williams, Elgar, John Singer Sargent, and William Morris of the Arts and Crafts movement. By the 1880's a small band of American artists headed by Francis Davis Millet discovered Broadway as a 'quaint reflection of a long ago country village'. Mary Anderson the American actress also lived in Broadway at Court Farm on the upper part of the High Street. Henry James (1843-1916, an expatriate American writer who settled in England and eventually became a British citizen) said: "Broadway and much of the land about it are in short the perfection of the old English rural tradition." Abbots Grange house (pretty much abandoned and deteriorating when Millet arrived) dating to the 14th century, is the oldest domestic building in the village and one of the oldest in the country. There are Tudor Houses dating from 1660's and along with parts of the Lygon Arms Hotel and St. Eadburgha's (grand daughter of King Alfred the Great) Church which has been a place of worship for almost 1000 years. The old church is one mile out on Snowshill Road. A legacy of the Broadway Artists Colony is the village uniquely has several of the country's best art galleries, which can be all too tempting at times! Russell House would be the centre of attention and animation of the Broadway Group of Artists. This was actually the second home of the colony. They moved here in 1886 after having lived for a year at Farnham House (overlooking the village green). Russell House was quite a bit larger than Farnham House and both Abbey and John Singer Sargent partnered with the Millets for a seven year lease. Visit Broadway Tower at 1024 feet above sea level this is the second highest point in the Cotswolds. From the top of the tower is one of England's finest viewpoints with 14 English counties to be seen on a clear day. The park affords picnics and a good restaurant. 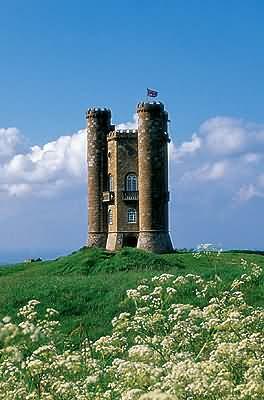 There is a nice cross-country walk up the Cotswold escarpment from the village to the tower see Broadway Walking below. Sir Gordon Russell was a well known furniture designer of the Arts and Crafts movement and until about 2000 still had a working furniture production factory in Broadway near to The Lygon Arms hotel. There is now a Museum, located in the original grade II listed workshop, celebrating the work of the renowned 20th century designer and manufacturer. The Broadway Museum opened in 2013 being the only partnership museum in the UK of the famous Ashmolean Museum in Oxford. Cotswolds.Info are proud to have been the first corporate sponsors to enable this important addition to the village to happen. You will find displays of furniture, objects, paintings and textiles from the Ashmolean’s reserve collections, as well as works from the private collection of the Keil family, will go on display in six rooms of the beautiful Tudor House. There will also be a gallery space dedicated to rotating exhibitions of works by local artists. For further information see - Broadway Museum and Art Gallery. There are several famous gardens within 15 minutes car journey of Broadway including Hidcote Manor, Snowshill Manor, Bourton House, Sezincote, Hidcote Manor, Kiftsgate Court and Batsford Arboretum. See - North Cotswold Gardens Map and Driving Directions. Broadway is centrally situated for visiting such Tourist Attractions as Warwick Castle, Stratford-upon-Avon, Snowshill Manor, Chastleton House, Worcester Cathedral, and the ancient villages and market towns including Chipping Campden, Stow-on-the-Wold, Bourton-on-the-Water, Moreton-in-Marsh, Upper and Lower Slaughter, Snowshill, Stanton and Winchcombe. away from the Cotswolds Way Trail. 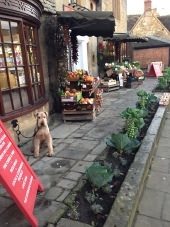 Walk to the ancient market town of Chipping Campden on the first leg of the Cotswolds Way Trail - 2 hours. Walk up the Cotswold escarpment to Broadway Tower where you will see fantastic views towards the Malvern Hills and the Black Mountains of Wales - 45 mins. Flat walk from Broadway to the old church of St. Eadburgha's - 35 mins. Walk through Bluebell woods to the quaint village of Buckland and even include a 'posh' afternoon tea at the Buckland Manor Hotel. Routes of all these local walks and more can be found from the small yellow book 'Country Walks around Broadway' available from the newsagents shop on the village high street. At the village of Stanton (7 minutes away by car). Broadway is situated on the edge of the Vale of Evesham and at the bottom of the Cotswold escarpment which is ideal for flat easy cycling. Explore the country lanes and visit villages such as Buckland, Laverton, Stanton, Stanway, Willersey, and Weston Subedge. You could of course in preference attempt 'Fish Hill' - one of the steepest and longest hills in England leading up the escarpment. Enjoying the slower pace of life and indulging in the English passion for tea and cream cakes in the several tea shops whilst soaking up the ambience of the 16th and 17th centuries. Broadway has one of the longest village High Streets in the UK and takes in the lower high street with shops, restaurants and tea shops and the upper high street with the beautiful mixture of ancient small cottages and rather larger grand houses. A favourite promenade is to walk the extent of the street taking in the natural beauty of the architecture combined with glorious gardens. Broadway has one of the best bowling greens in Worcestershire. Visitors and New Members are welcome. Broadway is the home of the North Cotswolds Hunt. See video of the traditional Boxing Day Meet that attracts many visitors to the village - normally sets off down the High Street around 11.00am. The park offers state-of-the-art facilities for children and adults of all ages, connected by soft-edged pathways with trees, shrubs and rocks. The activity park is located towards the top of the main high street set behind high street shops and houses. Willersey is a neighbouring pretty village only one mile away and has a C of E Primary school. The villages of Stanton, Snowshill, Bourton-on-the-Water, Upper & Lower Slaughter. The ancient wool towns of Chipping Campden, Stow-on-the-Wold, Moreton-in-Marsh and Winchcombe. 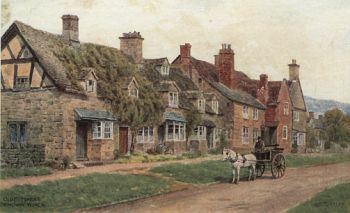 of Cotswold villages - the village still looks the same now! Tel: +44 (0)1386 859444, Mobile: +44 (0)7787 193334; Website: www.cotswold-tours.com.